​Know first and foremost, that this sport is SO much more that you imagine it to be. Be ready to experience a completely new level of fun when you choose to begin this adventure. Schedule an intro lesson, and get hands-on. Madcity Paragliding was everything that I was looking for in a training program. Commuting from Chicago, I very much appreciated the flexibility of creating my own training schedule. Some weeks I was able to come for multiple days, while others just a day; the training was consistent and top notch throughout. The comfort of knowing that I did not need to rush training was a selling point all in itself. The training location is perfect. You basically have your own private airport. Weather permitting, you’re able to get all your flights in with no other air traffic interrupting you. The sunsets are phenomenal. If weather is not on your side, there is still a lot to do. The hanger is comfortable and great for ground school. On days when ground school is complete and there is time to kill, you can ride around on ATVs and dirtbikes. There are so many ways you can have fun at Madcity Paragliding. Paul is an incredible instructor, there is no other way of saying it. He is very knowledgeable yet extremely humble. Paul is patient and has a very relatable way of explaining concepts and giving instructions. From day 1, you feel like you are one of his good friends. By the time you have your first flight, you confidently feel prepared and ready. I would 100% recommend training at Madcity Paragliding to anyone interested. Come and check Madcity Paragliding out; I promise you will not regret it. ​Earning the PPG 2 rating with the instruction of Madcity has been an amazing experience. After meeting Paul for the first time I knew that he was the right instructor. Enthusiastic, patient, and great work ethic are just a few qualities he owns. Before I started with Madcity I considered saving a few bucks by skipping training, buying equipment, and learning on my own. There is no way I could recommend that to anyone now. Training proved to be more challenging than I anticipated but fun and rewarding everyday. My control and confidence evolved quickly with the help of Paul’s eye for trouble shooting problems. The scope of the program also surprised me. I now think not only like a PPG pilot but a bit like a mechanic, meteorologist, and lawyer all smashed into one. Gear had always been on my mind. Paul never once pushed me to purchase anything except sunscreen and bug spray. I was able to try several brands and styles of wings and motors all throughout training. When I was ready to purchase my first wing he recommended several options. I am very happy with the wing I chose. The last flight of training was definitely the best. A no wind, 80 degree, XC flight with Paul and a previous Madcity graduate. After landing I was feeling confident with all the skills I had learned and ready to take to the skies at home. This is really just the start and Paul assured me, as well as past students, his doors are always open. I have had plenty of instruction in all kinds of outdoor sports, but Paul really surpasses everyone else. Learning to fly with Paul at Madcity Paragliding has been an incredible experience. From the first day, his enthusiasm for the sport was evident and his focus on safety put me at ease. The PPG community that surrounds the Madison area and Madcity Paragliding contains some of the nicest people I’ve ever met. Friends that I will for sure fly with in the future, Paul included. The training was systematic and comfortably progressive. The locations provide plenty of space to hone your ground handling skills, and you’ll even get experience gliding down the sledding hills to practice your flare when landing, all of which will give you confidence for your first solo. 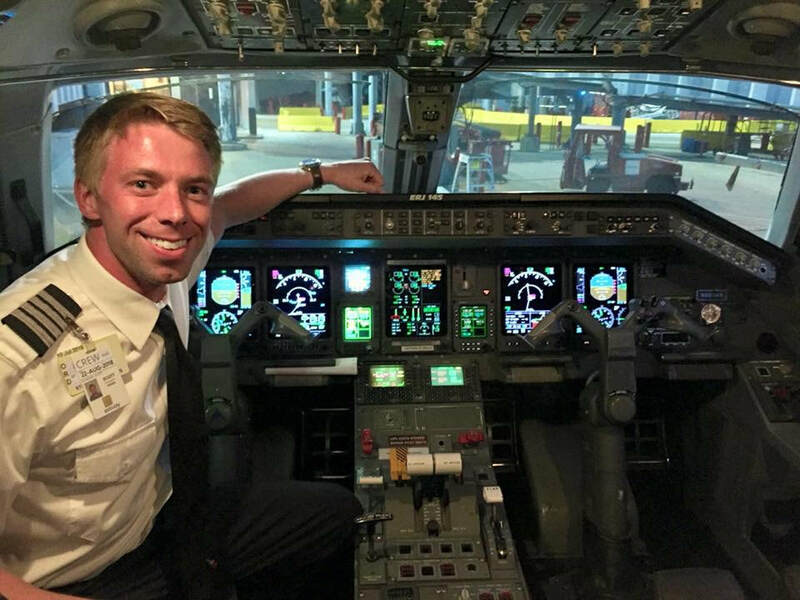 Paul’s ability to teach, his selfless commitment to his students, and his personality in general make him an excellent instructor, friend and flying buddy. ​Paul is an inspirational member of the PPG community in Wisconsin, it will be clear from the first time you meet him that he is doing this because he loves it. His passion will quickly rub off on you and before you know it you will be flying every chance you get! Learning to fly with Paul was a great experience even during the cold months of the year. His scheduling flexibility was key in my choice of instructor, he was very generous in finding times to teach on the weekend and after work. Paul puts in a lot of effort investing in his students ground handling skills, as well as understanding of risk and safety. Because of this I can fly with comfort and confidence, allowing me to enjoy the experience to its fullest." 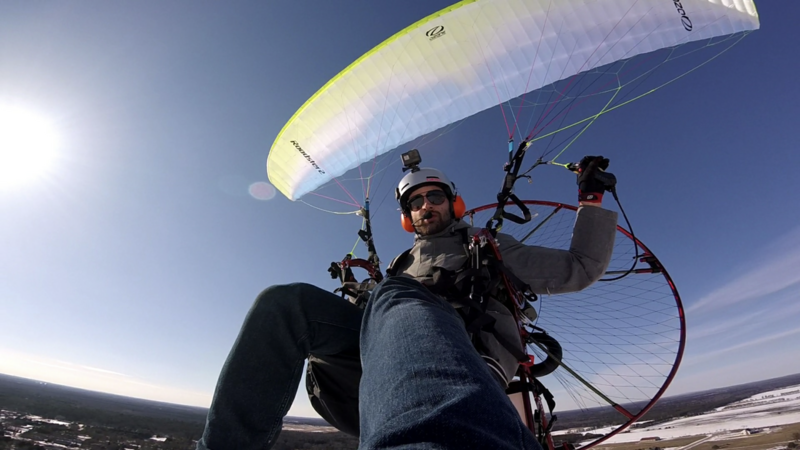 ​I am extremely happy that I chose to receive paramotoring instruction from Paul Cooley of Madcity Paragliding. Paul's instruction has not only been thorough, with an emphasis on safety, but was also a lot of fun! As Paul said when I decided to sign up: "We're going to have a blast!" Boy was he right! When I began searching for PPG training, it was important to me that the instructor be certified by the USPPA and be able to take me through to the PPG2 rating. These criteria alone eliminated most all of the flight training available within driving distance of where I live. 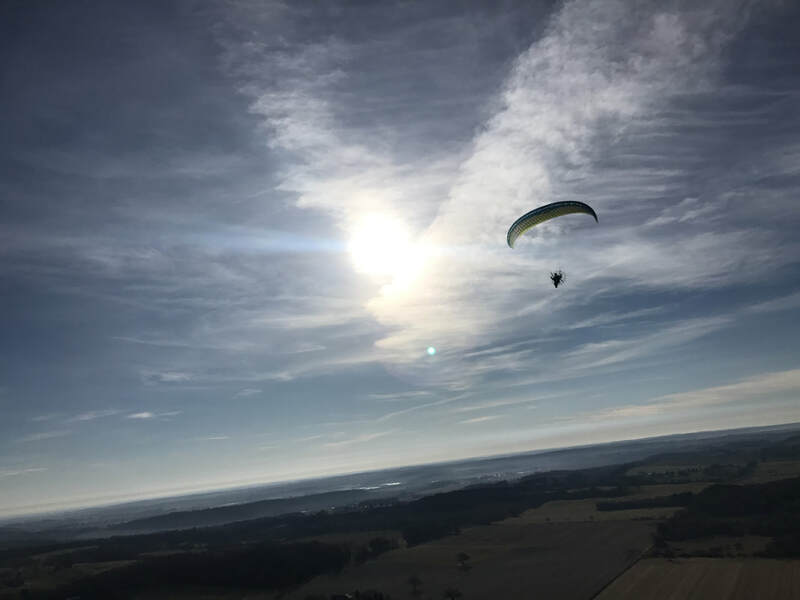 Another advantage of Madcity Paragliding is that Paul has equipment available for students to use until they make the decision to purchase their own. 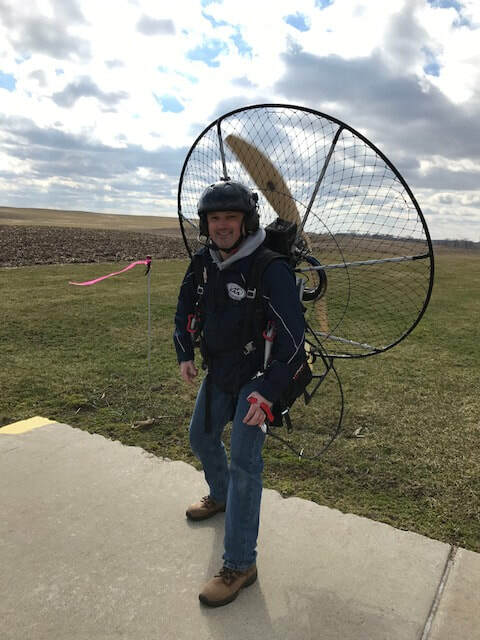 Paul has also been a huge help in choosing my own equipment, and even spent a Sunday afternoon helping me to assemble and break in my paramotor. Thanks to Paul and Madcity Paragliding, my forty year dream of being a pilot has finally come true. 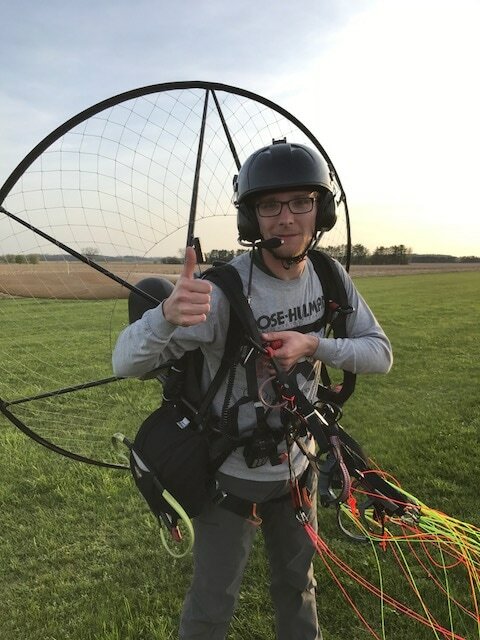 The entire process of becoming a paramotor pilot has been priceless. It's something you can look back on and just smile about. Paul Cooley has a great coaching ability and I think he has done an excellent job of explaining the sport while also helping me improve my skills out in the field. Paul knows of several places to meet and he has been very good about communication throughout year. Just about every weekend I would get a text from him as long as the weather permitted. My favorite flight with Paul was on the 4th of July 2017. I was shocked by the amazing the view that went on for miles and how comfortable it was sitting in the seat. Being on the radio with Paul made me feel that I was not alone either. After countless 2.5hr drives to Madison I can definitely say it has been the best experience of my life and it's great to meet others along the way too! Paul Cooley's enthusiasm for outdoor activities is abundantly clear from the first time you meet him. As an instructor he is thorough and motivating. He is a calm voice on the radio for your first flights. I am a private pilot with instrument rating and an Airframe and Powerplant mechanic so I have worked with a lot instructors. He ranks among the best. ​Paul provided a great learning environment and plenty of opportunities to practice skills with his expert supervision! It seemed like every day good enough to fly or kite I would receive a text or email to come out and continue training. Paul continually seemed dedicated to his students success and safety. Even having completed training I look forward to any opportunities available to continue flying with Paul and his students! After completing all of my requirements for PPG2, I can say that Paul gave me everything I needed to be a safe and independent pilot. When I first met Paul he answered all the questions I had about this amazing sport. All the gear necessary was provided, and he was able to work with my busy schedule. It only took a brief introduction and I was hooked. The classes were very easy to follow and training was engaging. Looking back the experience was just awesome, from ground handling to the first flight, I would do it again to get the first taste of those moments. If you have been thinking of flying, Paul can make it happen. Scott at his day job, I think the paramotor smile is a bit bigger! ​Over my past 7 years as a professional aviator -- first as a flight instructor and most recently as an airline pilot, I've come to appreciate the importance of quality flight instruction. 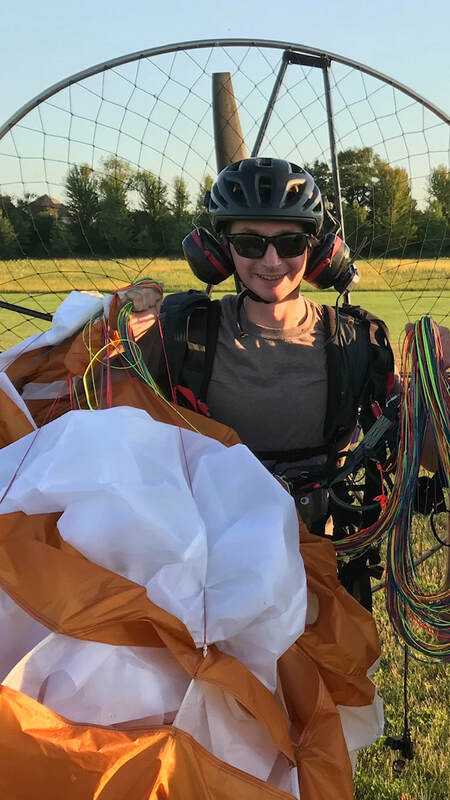 Since training with Paul at Madcity Paragliding and earning my PPG1 and PPG2 ratings with him through the USPPA, I can confidently say that his training has laid the foundation to make me a safe and competent powered paraglider pilot. Now I can enjoy the awesome freedom that my lawn chair in the sky provides -- it is truly the ultimate exploration tool. Everything is fascinating and beautiful from this new and different perspective. My first encounter with powered paragliding was through YouTube. 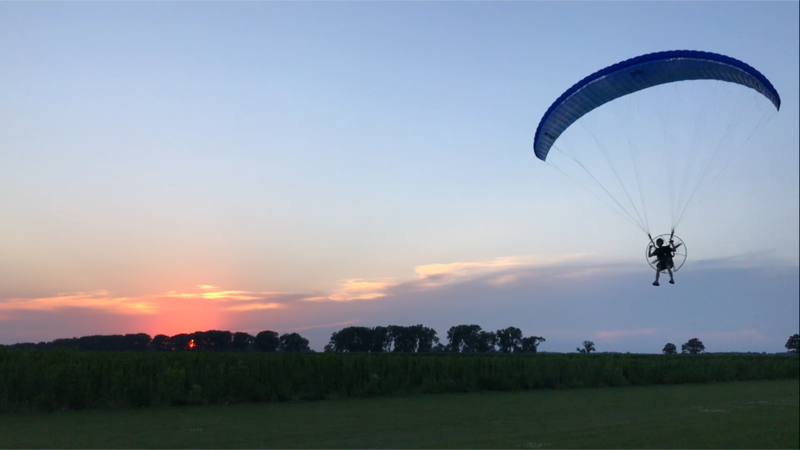 I saw the incredible freedom and precision that could be realized with a powered paraglider and knew that this was the kind of flying I'd been dreaming of my entire life. Searching through the USPPA database of instructors, I got in contact with a few instructors in my area. One instructor was a purely paragliding instructor who wanted me to earn paragliding ratings before transitioning to adding the motor. Fine, but not the route I wanted to go. Another instructor basically wasn't going to start working with me until I had gear purchased and ready to go. To me, this was like if my first flight instructor wanted me to buy an airplane before I even sat in a cockpit for the first time. Thanks but no thanks. Discouraged, I widened the net of instructors to the next state over. That's when I found Paul. 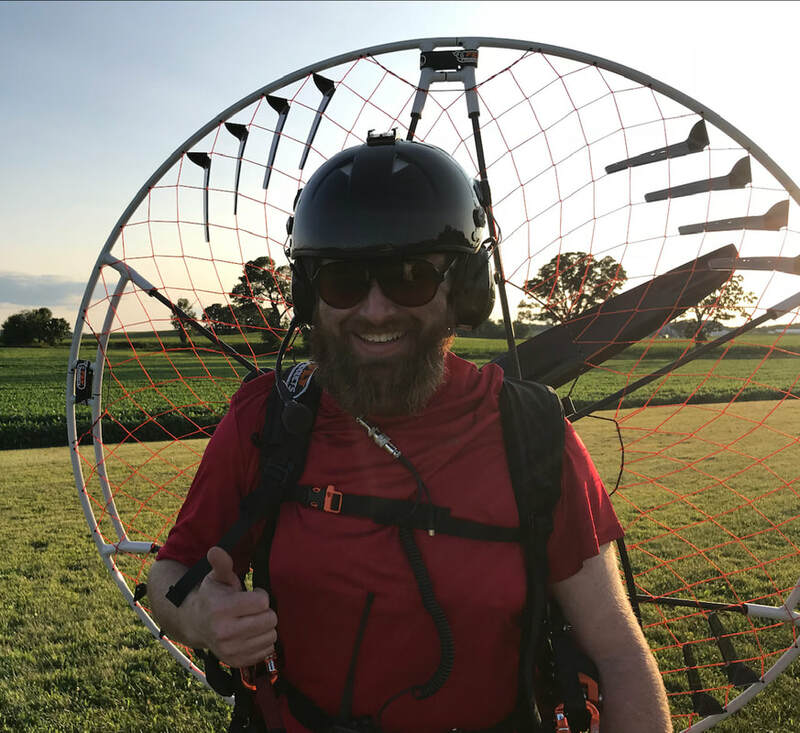 In his first message, I could tell that he had a genuine passion for powered paragliding and his excitement for the sport was contagious. My first time out was during an open house in early March. I got the opportunity to kite a paraglider and try on a motor to get a feel for what I would be getting myself into. At one point, I was clipped into the wing, trying my best to keep it under control when Paul asked if he could give me a little push. With that push, my running feet lost contact with the ground and I was flying like a bird. My feet might've been only an inch or two off the ground, but my head was in the clouds. 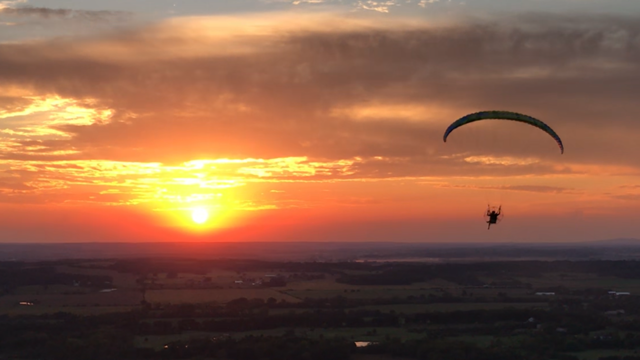 I was hooked on powered paragliding. From that first lesson, Paul helped me get the basics of ground handling down. From a distance, everything about powered paragliding seemed simple. It was only when I got up close with a paraglider and tried kiting it that I appreciated the nuances and challenges of the sport. Paul helped make this process simple and rewarding. He then helped me pick out a wing, understanding that I wanted something that would be safe to learn on but that I wouldn't grow out of quickly. I spent hours practicing on my own after the basic kiting instruction and when I came back the next week he saw that I was ready to move on. We added the throttle simulator, which is essentially a bicycle handle and brake. My first thought was that this was silly and unnecessary -- until the first time I tried kiting my wing with it in my hand and I felt like I was starting all over again! 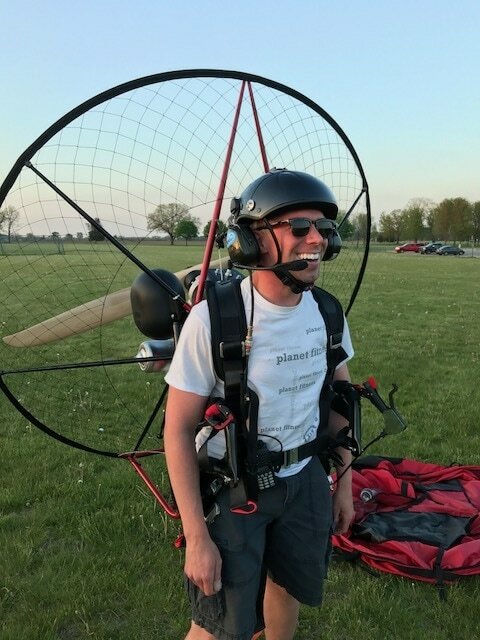 Each time we tried something new in the paramotor simulator, I found it surprising how seemingly simple tasks were in fact much more complicated and difficult than first glance would make you think. Every time I had one of these realizations, I was reminded of how glad I was to have Paul's instruction. Over the course of training, we spent lots of time ground handling the wing, working in the simulator, going through the knowledge areas of the USPPA PPG1 and PPG2 syllabi, selecting and building my own paramotor, and finally getting some air time off of a local sledding hill to get a feel for what paramotor flight would be like. On the day of my first flight, I remember feeling excited and exactly ready. Not rushed; not held back. Exactly ready. Also terrified. But the first flight was incredible, with my shouts and yells of joy audible from the ground even over the sound of my motor. With each subsequent flight, I got less afraid, more competent, and more independent. The goal of landing safely on my feet soon added the criteria that I be able to land within a painted circle on the grass. Each flight had a new and different goal and each lesson was awesome, rewarding, and fun. I recently finished the PPG2 syllabus and have been set free to start exploring and learning on my own. I feel confident in my ability not just to launch and safely fly, but also to make the determination of whether or not it is safe to fly in the first place. I look forward to expanding my wings as I gain experience and look forward to returning to fly with Paul soon to keep learning from his wealth of knowledge and experience.